For four days in October, during a citywide celebration of art, multidisciplinary art duo STATIC will unveil a brand new body of work at London’s Lawrence Alkin Gallery. To celebrate the launch of their latest creative direction, STATIC will be rolling out an ‘on street’ campaign for London’s art lovers – offering the opportunity to acquire original pieces throughout the week by finding objects inspired by the TRYKSTRS. Throughout the duration of the gallery pop-up, clues and locations will be revealed via STATIC’s social media platforms (@welikestatic) as feather totems on arrows are scattered across the city. Blending pattern with portraiture, STATIC’s influences range from the mythological and historical to subcultural equivalents including gamers, trends and brands. The duos latest body of work The TRYKSTRS focuses on the concept of identity and persona. Through familiar symbols and objects with their own historical relevance, STATIC challenges the viewer to consider their own cultural identity or ‘tribe’. Transitioning from street art, the new works are an evolution of the layered multimedia pieces the duo has been creating over the past five years. 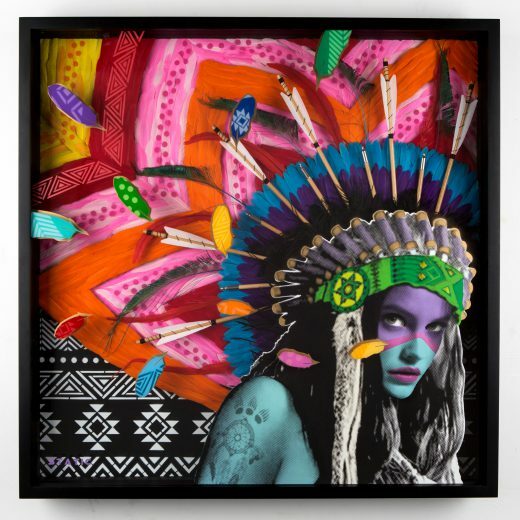 The showcase will feature three large original works, each around one meter wide, featuring an individual female portrait, layering techniques and a range of mixed media, specifically arrows and brightly-coloured feathers. Craig and Tom collaborate on each and every STATIC artwork, with The TRYKSTRS series taking four months to complete. Back in 2008 STATIC launched their Games Series with an image titled ‘Right Hand Red’. This series took black and white images and incorporated new elements with bursts of colour. Since then STATIC have pushed colour to the front of their works and are constantly experimenting with different materials and colour combinations. Informed and inspired by the things they see and the places they travel, Tom and Craig are fascinated with modern tribes and cultural identities. This led the pair to explore customs and costumes from around the world, such as the Native American headdress elements seen within the new series. Each piece in The TRYKSTRS series is contained within it’s own bespoke frame, integral to the way the artists intend the collection to be displayed. In tandem with the gallery showcase, STATIC will release an exclusive original detail study at London’s Moniker Art Fair. A continuation of The TRYKSTRS series, this will be available on the Lawrence Alkin Gallery stand at the fair from 6-8 October.